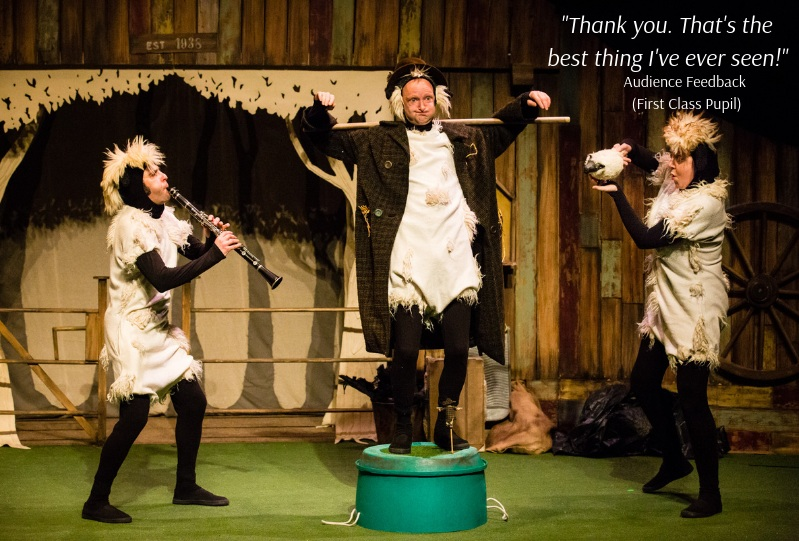 Our spring tour of Woolly’s Quest took place from February - April 2019 with visits to 9 venues across Ireland. If you missed us, join our mailing list here to be the first to find out about our latest and upcoming productions. This is the epic story of Woolly, the bravest of all sheep. Woolly was the first sheep who dared to be different, she dared to be adventurous, she dared to discover what happens to her wool. Join Woolly on her audacious quest to reclaim her shorn fleece, marvel at her sheer bravery on a journey fraught with peril to learn what life looms beyond the gate. Léiríonn Branar Téatar do Pháistí, i gcomhpháirt le Riverbank Arts Centre, leagann stáitse de Woolly’s Quest. Pléann an scéal iontach seo an chumacht a bhíonn ag samhlaíocht an pháíste. Seo scéal eipiciúil Woolly, an chaora is cróga dá bhfuil ann. Ba í Woolly an chéad chaora a raibh sé de mhisneach aici a bheith éagsúil, a raibh sé de mhisneach aici a bheith eachtrúil agus a raibh sé de mhisneach aici fáil amach cad a tharla dá holann. Tar le Woolly ar a haistear dána chun a lomra bearrtha a fháil ar ais. Déan iontas dá fíorchrógacht ar aistear lán contúirte agus foghlaim cad atá i ndán di sa saol ar an taobh eile den gheata. Casann agus lúbann scéal Woolly ar nós snáithe olla agus fíonn Branar an scéalaíocht, an ceol, an amhránaíocht agus an phuipéadóireacht le chéile chun taispeántas spleodrach a chruthú a mbeidh idir óg agus aosta gafa leis!i. Woolly's Quest is available for international touring.